An impressive French side easily dispatched the US Women, 2-0, in Lorient, France on Sunday afternoon. Eugenie Le Sommer and Jessica Houara scored a minute apart early in the second half against a faltering US team that seemed overmatched for much of the game. Abby Wambach had a penalty saved mid way through the second half to put further pressure on the American squad. The US now has only one win in its last five matches since qualifying for the World Cup in late October. That win came against lowly Argentina in mid December. Coach Jill Ellis started in a curious 4-4-2 with Alex Morgan and Christen Press leading the forward line. With Megan Rapinoe unavailable due to injury, Carli Lloyd was pushed from her normal central position to a role out on the left of midfield. Stalwart defender Christie Rampone also missed out through injury, so Whitney Engen and Becky Sauerbrunn started in the center of defense. 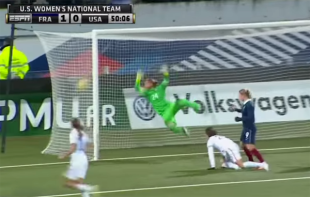 With Hope Solo still suspended, Ashlyn Harris was given the start in net. The French were the more assured side from the start and controlled possession while the Americans looked to strike on the counter attack. Eugenie Le Sommer would get the first opportunity of the match, hitting a well struck volley over the bar from 18 yards. The very active French striker came close again on 17 minutes when she brought down a ball over the top, only the have her shot fly high and wide of Harris’ net. It would be close to the half hour mark before the US created their first clear cut chance of the match. A nice move saw Christen Press and Tobin Heath combine and eventually get the ball to Alex Morgan 16 yards from goal, but the striker could only fire wide left. The French grew further into the game and forced Ashlyn Harris into two strong saves just before the half. Élodie Thomis met a well struck corner and Harris tipped the volley over the bar. Harris was again able to keep out a well struck shot a minute later, again tipping over the bar. Carli Lloyd would have a great chance to give the lead to the Americans shortly after the break. A ball over the top was knocked down by Tobin Heath and eventually fell to Lloyd. The Delran native did well to create space to shoot, but she could only fire high over the bar with her left foot. France would take the lead shortly after with a well worked goal down the right side. Thomis did well to get to the endline and loft up a cross to the back post where Eugenie Le Sommer rose highest to nod in a header from 5 yards out. The lead would double just a minute later on a somewhat fortuitous goal from Jessica Houara. Another move down the French right side gave Houara room to cross from the edge of the US penalty area. The cross was actually poor but spun straight into the top corner of the American net, giving Harris no chance. All-time leading US goalscorer Abby Wambach was introduced in the 63rd minute as the US looked to get back into the match. Within just a few minutes of being on the pitch, the striker was lucky to earn a penalty after she went down inside the French box under minimal contact. Wambach took the penalty herself, striking a poor effort to the left that French goalkeeper Sarah Bouhaddi did well to get low to save. Wambach would have another chance to cut the French lead on 75 minutes when she met Lauren Holiday’s corner near the penalty spot, but nodded an open header wide of the French goal. Former Philadelphia Independence striker Amy Rodriguez was brought on in the 77th minute, but the French would have the last best chance to score when Élise Bussaglia’s shot skimmed the outside of the post seven minutes later. With the 2-0 loss, combined with a 0-0 result in Brazil in December, the US has now been shutout in consecutive matches for the first time in 13 years. The Americans will look to rebound when they take on England at 3 pm on Friday (Fox Sports 1,Univision Deportes). I feel like the Womans soccer world is catching up to us fast and we will soon be facing the same problems we do in the mens sccer world. We have always had those same problems in the women’s game abd yes the rest of the world finally decided to pay attention to their women players. The huge jump in quality is an indictment on our programming and lack of understanding about the game. Expected result- I just thought we would score once. I think the ladies miss Pia coaching them. Granted they were missing a few starters yesterday, but they still did play a bad game. France owned them. I think women’s soccer suffers from the same thing men’s soccer suffers from— to start as evidence more recently— a/our/THE cultural issue(s) extend(s) beyond the bounds of just men playing DA and youth and recreational play and second there is a lack of educational, philosophical, technical and tactical cohesiveness or continuity across the development spectrum. This is NOT an outlier. The world, 3 or so countries really, has caught up and our improvement has not been commensurate. Soccer is not a game won by force and athleticism and brute intimidation when the people you are playing against are more wily, cleaner technically and better manipulators of the space the game is played in. To the USA, space is something for us to move into with the misguided notion of connecting a pass, to the best countries, space is something to move the other team into to create the ACTUAL space you are really seeking. We have a FUNDAMENTAL misunderstanding of properly using space in the USA – until that changes, beyond our technical deficiencies– it is and will always be more of the same – just now, it is across the USWNT board as well. France is good. They play the beautiful game. I read an article just recently about a coach who went to three top La Liga clubs to examine their structure/methodology and to a club– across the youth to the first team, the same exercises were being practiced- just more and more layering as the tactical awareness and age groups became older. The same thing the first team was practicing at Joan Gamper — a bunch of 8 year olds were practicing at La Cantera. And this occurred in each of the clubs the coach explored. Beautiful. Nothing is left to chance. No Thing.